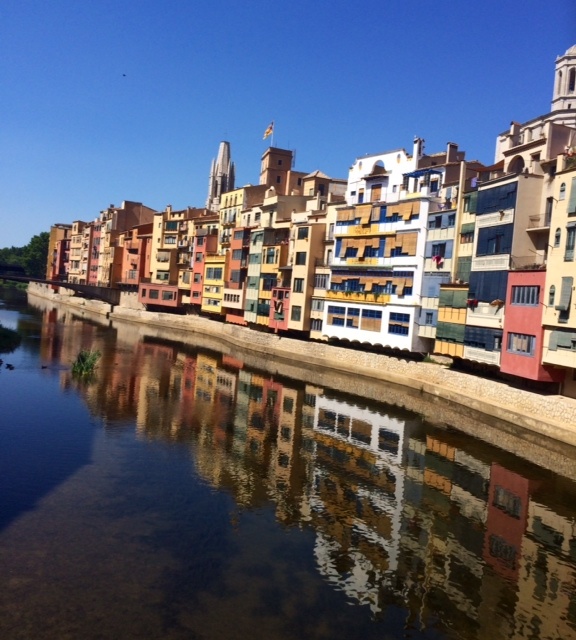 Catalan Girona is a 2,000-year-old jewel. I am so grateful that I splurged on a tour of this ancient city. My morning started out boarding a high speed train to a tiny town, Figueres, near the French boarder to see the Salvador Dali Museum. It was interesting, and I loved hearing about the Surrealist’s bizarre life. 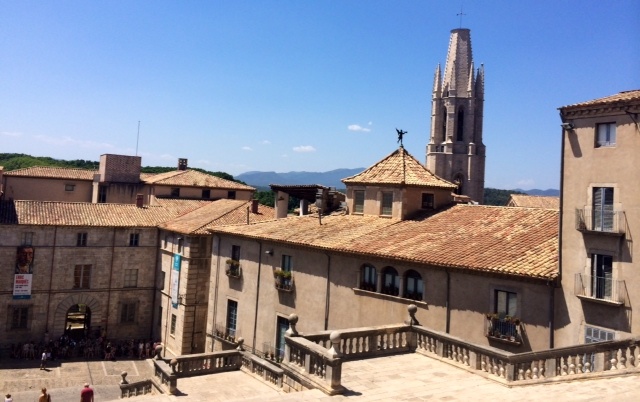 But the next stop, Girona, made my heart sing. This city, which pre-dates Roman times, is gaining American familiarity as it is where much of HBO’s Game of Thrones is being filmed. My amazing tour guide explained that in the first century BC, the Romans built a fortress with an almost triangular perimeter (a kind of acropolis) known as Força Vella. The fortress was very well protected by a defensive rampart built from large stone ashlars. 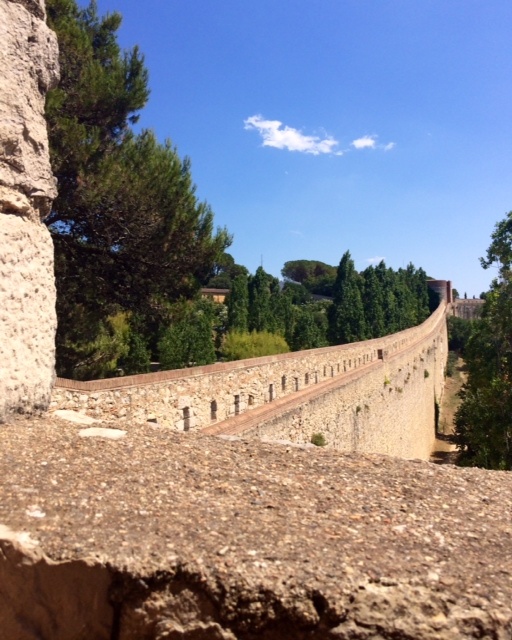 This was the first city enclosure and it remained unchanged until the year 1000. This is an extension of the wall. Below, is theForça Vella with parts from the original section in the first century. The Cathedral has sections that date back to the 11th century, making the nave and the stone glass windows some of the oldest in existence. 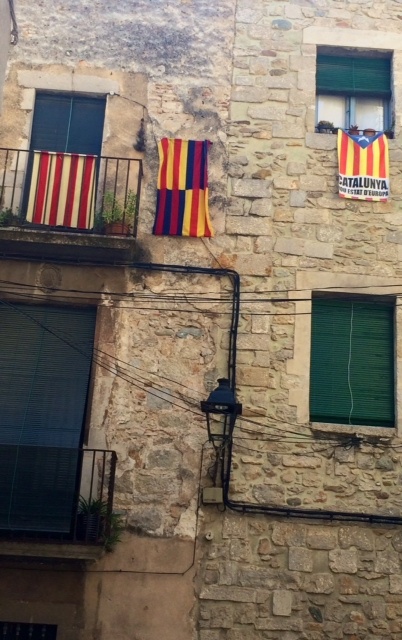 What is wonderful about this Catalan region is how vibrant it still is and how proud the locals are. 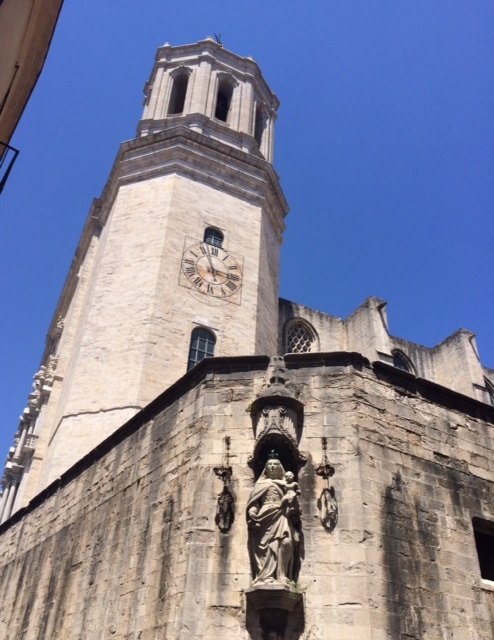 Our tour guide, who lives in Girona, said: “Nearly no one leaves and no one considers themselves Spanish. They are quite independent Catalans. Eh?” She had a cute way of saying “Eh?” at the end of statements that seemed important to her—like a nudge to get me to understand, rather than a question. The city center has dramatic views with quiet but steady winds that seem to whisper the history of this city. I could imagine life there more than 1,100 years ago when Charlemagne overtook the Moors, to the Roman times and then later to the Catholic expulsion and “conversion” of the Jews. History definitely is alive and flourishing in this city, which now depends on tourism for much of its economy. I loved the immersion in thousands of years of struggle and culture, that is rare for an American to experience. It’s in moments like today when I feel with complete certainly that I am a mere speck of dust on the timeline of this Earth. 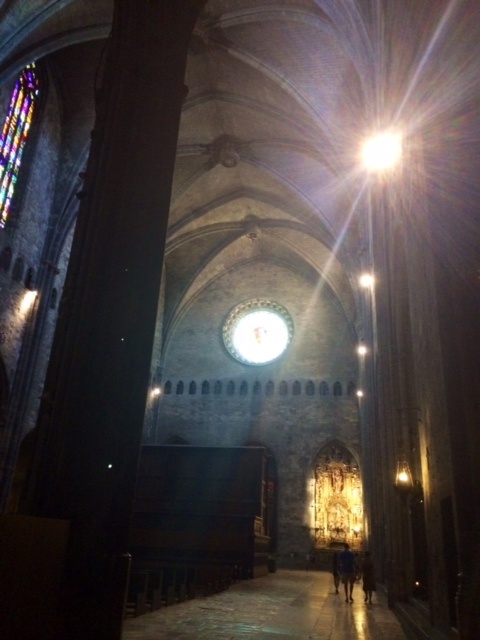 Being in a place like Girona, or Montserrat (where I visited last week) helps put life in perspective. We are mere specks of star dust, with such short lives. It reminds me of two important things. First, how important is the petty stuff, worries and ingrained habits? Seriously, I need not take myself so damn seriously. And Second, life is so very short. 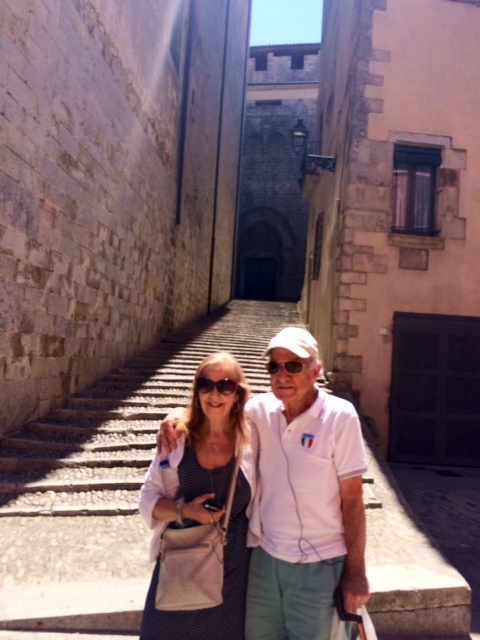 I spent most of the 10 hour excursion today with an old French couple, Henri and Violet, married 50 years now, who relished every minute of the Dali and Girona tours. They were so grateful to still be able to go up cobble stone pathways, or steps and take in the views. Henri had a pace maker and had also undergone spinal surgery. He was a lucky man to be there—and he knew it. The two were holding hands, laughing, asking so many questions and were such a delight for me to be around. It was a joy to see the city through their eyes. As much as they could do—hiking up to the top of the center wall wasn’t possible. But they were able to see and do so much and were so happy just to be alive and to be together. And their love for life and each other was contagious. Our tour, that required that we hike in 95 degree temperature, ended at 5 p.m. in the city center where locals were just beginning to come back out and cool off. Talk about joy for living! This little boy ran up to me and splashed water on me, while singing something that I’m sure was a taunt to get me to follow suit. His father laughed and laughed. (Something I’m becoming so fond of, how I see more parents laughing, rather than scolding, their children in Spain. It’s a refreshing difference from America.) 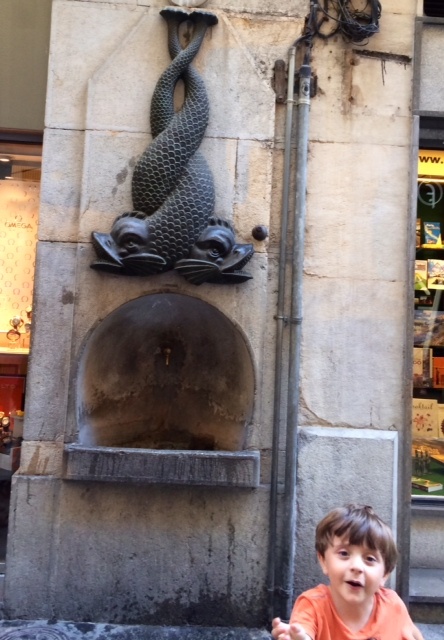 After I shot this picture, the boy dragged me to the fountain where he splashed me properly! That’s the way to cool off! After my train ride back to Barcelona with Henri and Violet, we hugged, kissed and exchanged contact information. Henri kissed my hand saying it was a joy to be together. And that’s the wonder of traveling. You never know whose path you’re going to cross or how they will affect you in a wonderful way. I was afraid to travel by myself initially, but am so glad that I opened my heart up to new possibilities, new horizons, new experiences and new friends! 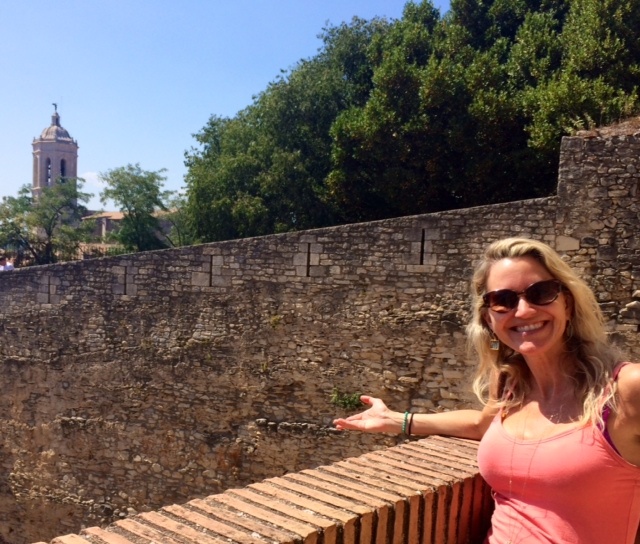 This entry was posted in Single Mom and tagged Barcelona day trips, Catalan towns, Game of Thrones, Girona, Salvador Dali, Tips for travel in Spain, Tips for traveling solo, traveling alone in Europe, Traveling in Spain solo. Bookmark the permalink. your photos are beautiful! and i love the “joy for living”! thank you! !